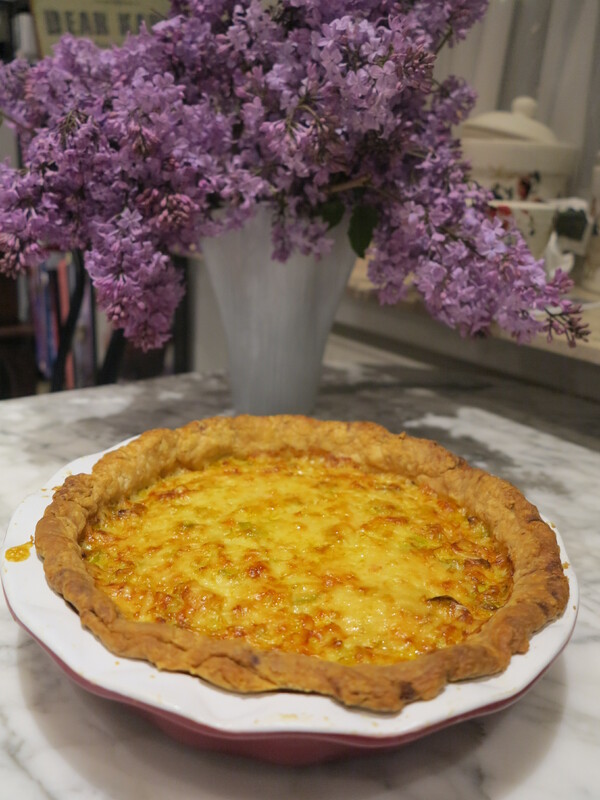 From the moment my husband saw the ingredients list for this week’s French Fridays with Dorie recipe, Quiche Maraichere, he started lobbying for change. I’m sure he thought that he was being subtle about it, “Don’t you think some sausage would be a great substitute for, oh, I don’t know, say the bell pepper?”. To be honest, he’s probably right, it probably would have been very tasty, but that’s not the recipe we’re making this week. Nope, this week we made a very veggie filled quiche. Even the word quiche is a bit of a stretch because there were barely any eggs in there, mostly just pastry crust filled with veggies. At this point you might be agreeing with my husband and wondering why I didn’t follow his suggestion to jazz it up a bit. To be honest, I was starting to wonder myself. And I started to wonder even more after the darn thing was still malingering in the oven a good 20 minutes past the recommended cooking time, and still wasn’t puffed at all! My crust was starting to burn and my side dish (quinoa w/ goat cheese & spinach) was already long done and getting cold. It had already been a long day, I was hungry, and I just wasn’t in the mood for a recipe to step out of line. I made myself a plate of quinoa, thinking that it might be the only thing we were going to get for dinner that night, and left the kitchen in a huff. Some time later, I’m not even sure how long in total, my husband called me into the kitchen. I walked in, still a bit grouchy, to find that he had taken the quiche out of the oven (beautifully puffed), had moved some flowers to set the backdrop, and was trying to take pictures for me. How sweet is that! I couldn’t stay grouchy after that. The quiche, by the way, was delicious. I was rather surprised myself that such a bland list of ingredients could come together into something so simple and tasty. Very cute that your husband was taking pics for you. Kitchen disasters seem so much worse when you’re starving from the start, so I’m glad you were happy with the quiche in the end. Aw, what a sweet hubby! I think this was a hit across the board! You have a very sweet hubby! Love his presentation with the quiche and lilacs! He has an eye! Glad you enjoyed this one Rose! It was a hit in my house too! I love this post! I haven’t made the quiche yet, but I can’t wait! Sweet guy you got there! Envy you for the Lilacs! I had no problems with the final leg of the recipe, but had some trouble with the rolling of the pastry for lining of the pan. It turned out well in the end. That’s a nice ending to your frustration – a beautiful quiche and a sweet, helpful husband! Rose, I guess you will not be impressed with me this week because I did change the veg in this recipe to reflect what we like in our quiche – but no sausage…So very nice that your darling husband brought you Flieder and took pictures – your quiche looks absolutely delicious and wonderful! Aw! That was nice. Thanks for sharing! Now that is a nice man. Yea, husbands. I am surprised that your quiche would come out of the oven smiling and posing after you had been so “abusive” about discussing it!!! But, do feel your pain after a long work day and just trying to get the French Fridays recipe made anddddd have something to eat. This blogger business is not easy, right? Your quiche looks delicious. I agree with Mary! The Blogger business is not easy but it seems that it is quite contagious to our husbands who are helping us and make suggestions about the recipes! Along with your beautiful quiche he is a winner this week! What a sweet husband. I love the flowers in the background. I HATE when recipes take a lot longer than they said they would, especially when I’m hungry, so I completely understand your reaction. Your husband provided a beautiful setting for your photo Rose. I think we all had the same thoughts on the quiche! It was amazingly good, though, wasn’t it? It was really good, wasn’t it. Kudos to your hubs for a great pic setup. I’m thinking bacon next time in the quiche.